Culture consists of the social behaviour and norms found in human societies and transmitted through social learning. Cultural universals in all human societies include expressive forms like art, music, dance, ritual, religion, and technologies like tool usage, cooking, shelter, and clothing. The concept of material culture covers physical expressions such as technology, architecture and art, whereas immaterial culture includes principles of social organization, mythology, philosophy, literature, and science. The term "bioculture" has been proposed to cover all the practical uses (but not the symbolic ones) of living things in culture, including agriculture, production of food and clothing, forestry, animal breeding and training, the pet trade, use of living things in science, zoos and aquariums, animal sports, and the raising of game animals for sport hunting. Anthropology has traditionally studied the roles of animals and of plants in human culture in two opposed ways: as physical resources that humans used; and as symbols or concepts through totemism and animism. More recently, anthropologists have also seen living things as participants in human social interactions. This article describes the roles played by living things in human culture, so defined. The human population exploits and depends on a large number of animal and plant species for food, mainly through agriculture, an essential component of human culture, but also by exploiting wild populations, notably of marine fish. Livestock animals are raised for meat across the world; they include (2011) around 1.4 billion cattle, 1.2 billion sheep and 1 billion domestic pigs. Laboratory mice are widely used in medical research. The colourful floral display in the Isabella Plantation, Richmond Park, London attracts many visitors. 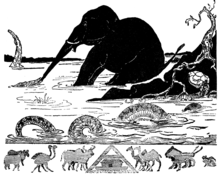 "How the elephant got his trunk" in Rudyard Kipling's Just So Stories, 1902. Below the main image, a parade of animals go two by two into Noah's ark. Animals are important in religions such as Hinduism. Here, cattle listen to Krishna's music. Animals including many insects and mammals feature in mythology and religion; indeed, animals and plants appear in what has been suggested to be the world's first religion in the Paleolithic era. Among the insects, in both Japan and Europe, as far back as ancient Greece and Rome, a butterfly was seen as the personification of a person's soul, both while they were alive and after their death. The scarab beetle was sacred in ancient Egypt, while the praying mantis was considered a god in southern African Khoi and San tradition for its praying posture. Among the mammals, cattle, deer, horses, lions and wolves (and werewolves), are the subjects of myths and worship. Of the twelve signs of the Western zodiac, six—Aries (ram), Taurus (bull), Cancer (crab), Leo (lion), Scorpio (scorpion), and Pisces (fish)—are animals, while two others, Sagittarius (horse/man) and Capricorn (fish/goat) are hybrid animals; the name zodiac indeed means a circle of animals. All twelve signs of the Chinese zodiac are animals. ^ Taylor, Paul W. (2011). Respect for Nature: A Theory of Environmental Ethics (25th Anniversary ed.). Princeton University Press. pp. 53–54. ISBN 978-1-4008-3853-0. ^ "Editors' Introduction". Cultural Anthropology. 25 (4). November 2010. Retrieved 12 September 2018. Creatures previously appearing on the margins of anthropology—as part of the landscape, as food for humans, as symbols—have been pressed into the foreground in recent ethnographies. Animals, plants, fungi, and microbes once confined in anthropological accounts to the realm of zoe or 'bare life'—that which is killable—have started to appear alongside humans in the realm of bios, with legibly biographical and political lives. ^ Ogden, Laura A.; Hall, Billy; Tanita, Kimiko (2013-01-01). "Animals, Plants, People, and Things: A Review of Multispecies Ethnography". Environment and Society. 4 (1): 1–24. doi:10.3167/ares.2013.040102. ^ Ksenzhek, Octavian S.; Volkov, Alexander G. (1998). "Humans and Plants". Plant Energetics. Elsevier. pp. 335–345. doi:10.1016/b978-012427350-4/50016-9. ISBN 978-0-12-427350-4. ^ "Fisheries and Aquaculture". FAO. Retrieved 8 July 2016. ^ "Food and drink". Kew Gardens. Retrieved 20 June 2016. ^ "Chemicals from Plants". Cambridge University Botanic Garden. Missing or empty |url= (help) Note that the details of each plant and the chemicals it yields are described in the linked subpages. ^ "BARBARA McCLINTOCK:A Brief Biographical Sketch". WebCite. Archived from the original on 21 August 2011. Retrieved 21 June 2016. ^ Osbaldeston, Tess Anne (translator) (2000). Introduction. Dioscorides. Johannesburg: Ibidis Press. pp. xxi–xxvi. Archived from the original on 2014-09-24. ^ De Vos, Paula (2010). 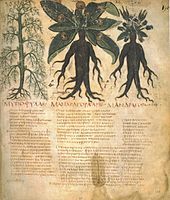 "European Materia Medica in Historical Texts: Longevity of a Tradition and Implications for Future Use". Journal of Ethnopharmacology. 132 (1): 28–47. doi:10.1016/j.jep.2010.05.035. PMC 2956839. PMID 20561577. ^ "Will Your Retirement Home Have A Liquor License?". Forbes. 26 December 2013. ^ "Coca leaves first chewed 8,000 years ago, says research". BBC News. 2 December 2010. ^ "CHAPTER 1 Alcohol and Other Drugs". An overview of alcohol and other drug issues. ISBN 978-0-7245-3361-9. Archived from the original on 2015-03-28. ^ Meagher, Jennifer (August 2007). "Botanical Imagery in European Painting". Metropolitan Museum of Art. ^ Moisseeff, Marika (23 January 2014). "Aliens as an Invasive Reproductive Power in Science Fiction". HAL Archives-Ouvertes. Polis, Sofia. pp. 239–257. ^ Williams, Robyn; Field, Scott (27 September 1997). "Behaviour, Evolutionary Games and .... Aliens". Australian Broadcasting Corporation. Retrieved 30 November 2017. ^ Tolkien, J. R. R. (1954) The Fellowship of the Ring, I 12 "Flight to the Ford". ^ Tolkien, J. R. R. (1954) The Fellowship of the Ring, II 6 "Lothlórien". ^ a b Tolkien, J. R. R. (1954) The Return of the King, VI 9 "The Grey Havens". ^ Tolkien, J. R. R. (1954) The Fellowship of the Ring, I 6 "The Old Forest". ^ Cameron, James. "Avatar" (PDF). Avatar Screenings. Fox and its Related Entities. p. 25. Archived from the original (PDF) on 27 May 2010. Retrieved 9 February 2010. ^ Lawlor, C. (2006). Consumption and Literature: The Making of the Romantic Disease. Palgrave Macmillan. p. 215. ISBN 978-0-230-62574-7. ^ Lemlein, Rhoda F. (1981). "Influence Of Tuberculosis On The Work Of Visual Artists: Several Prominent Examples". Leonardo. 14 (2): 114–11. JSTOR 1574402. ^ a b Morens, David M. (November 2002). "At the Deathbed of Consumptive Art". Emerging Infectious Diseases. 8 (11): 1353–1358. doi:10.3201/eid0811.020549. PMC 2738548. PMID 12463180. ^ Conklin, Edward D. (July 2002). The First Religion: Evidence for its Beginning and Earliest Artistic Expressions. University of South Australia (Ph.D. thesis). Retrieved 12 September 2018. I will argue that the images of animals, plants, and hand prints were drawn primarily by women as a result of the perceptual processes of animism, anthropomorphism, dream imagery, and the analogically reasoned gynocentric view that the interior of the earth was the female-like greater origin of life. ^ Ķencis, Toms (2011). "The Latvian Mythological space in scholarly Time" (PDF). Archaeologia Baltica (15): 144. Archived from the original (PDF) on 25 March 2012. Retrieved 21 August 2012. ^ Beatrice White (1945). "Whale-hunting, the barnacle goose, and the date of the "Ancrene Riwle". Three notes on Old and Middle English". The Modern Language Review. 40 (3): 205–207. JSTOR 3716844.